Hudson Valley Duck Farm is a 200 acre farm located in Ferndale, New York. We breed various types of duck at the farm – the classic Moulard and a heritage breeds — then deliver fresh product and charcuterie to weekly farmer’s markets in New York City. The farm is cage free. You’ll find us at the Union Square Greenmarket on Mondays; at the Union Square, Grand Army Plaza, Fort Greene, Tribeca, Tucker Square and Inwood Greenmarkets, as well as the Hastings and Tenafly Farmers Markets, on Saturdays; and at the Columbia and Carroll Gardens Greenmarkets on Sundays. Come visit us! 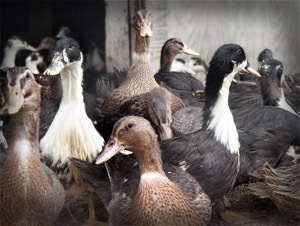 Here at Hudson Valley Duck Farm we believe birds need room to spread their wings. For the past nine years, we’ve raised our ducks cage-free, which means they can socialize, run around, and preen their feathers as often as they please. Our ducks are raised on a high-quality, pure vegetarian diet exclusively blended in our own farm recipe. This ensures healthy ducks that are never treated with antibiotics or hormones.We sell our duck at New York state farmers markets and on our website. Summer is great time to cook duck breast on the grill.